The Bread Winner only got a passing bite of tortilla last night as he went out to the Comedy Festival with some friends. He did pause briefly to comment on it’s deliciousness. Knowing that Mexican food is to him as Vietnamese food is to me, I thought it only fair to have some form of repeat performance tonight. As a slight variation on last night for the rest of us, I’ve used yellow masa harina instead of white and I’ve made twice as many tortillas. This is a definite start the day before and prepare to have it cooking all day type of meal. Ham hock can be omitted for vegetarians and it will still taste great. Actually, this was worth every single second spent cooking it. It took delicious to new heights. I heart black beans. 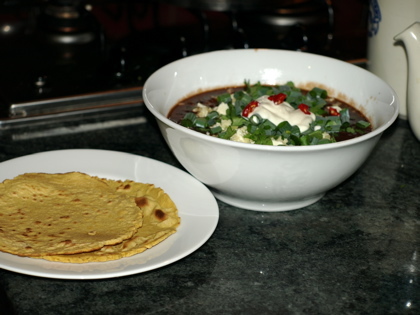 Pork and Black Beans with Yellow Corn Tortillas. Soak black beans overnight in warm water and juice from 1/2 lemon. Drain and transfer beans to slow cooker. Cover with water and turn onto high until boiling. Skim scum from top and turn to low. Add crushed, peeled garlic, onion, chillies, cumin, cocoa, tomatoes and ham hock. After about 8 hours, spoon most of beans into a food processor (or thermomix) and puree. Return to slow cooker. Shred meat of ham hock, remove bone and leave on low until ready to serve. Serve in bowls and garnish liberally with spring onion, coriander, cheeses, chilli and sour cream.